Summary of Taking Part data for the engagement in the Arts during 2016/2017. 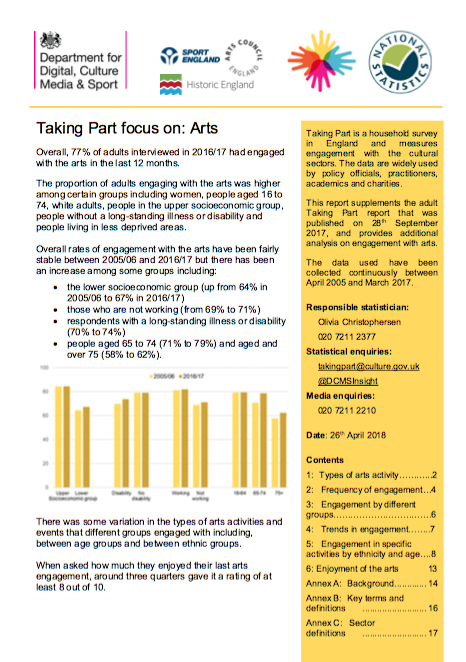 Shows that 77% of adults interviewed had participated in the arts in the 2016/2017 research year, and breaks figures down into arts forms and demographic groups. Reports a small increase in engagement from those of a lower socio-economic class (up 3% to 67%); those who are not working (from 69% to 71%); respondents with a long-standing illness or disability (70% to 74%); people aged 65 to 74 (71% to 79%) and aged 75 and over (58% to 62%).